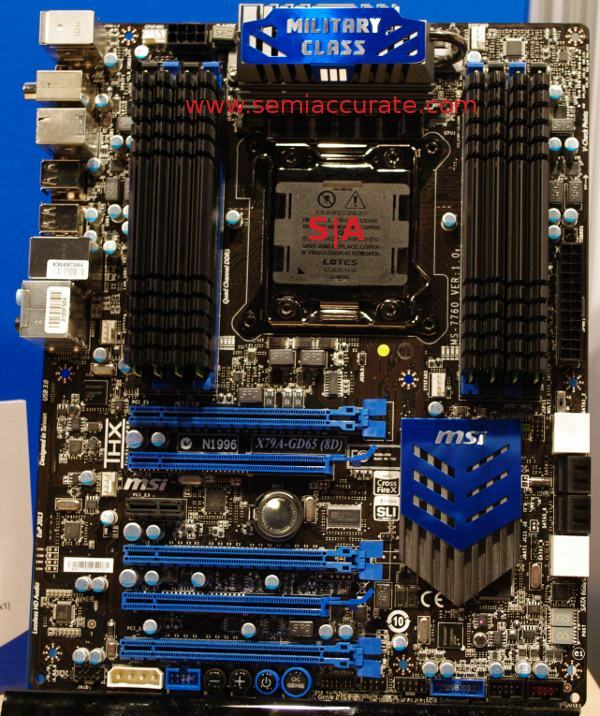 MSI was showing off two things of note at IDF, a new X79 board and a prototype widget. Neither is going to be released for a bit, but both should be out before the end of the year. The board above is the X79A-GD65(8D), the newest X79 enthusiast board from MSI. If you are wondering what the difference is between that and the older X79A-GD65 shown at Computex, the 8D stands for 8 DIMMs. Short story, the GD65 has 1 DIMM per channel, four channels, the GD65(8D) has 2 DIMMs per channel, four channels. That is about it. The final will look nothing like this. The other bit is a voice recognition board. In case this name doesn’t give it away, MSI is trying to give the buyer the ability to say commands to the PC and have it do them. By the time you are able to buy a product with this feature, it will look nothing like what you see here, it will just be on the board. This card uses the 1x slot for either power or just mechanical placement, it doesn’t need data from the system across PCIe.